Glad I don't need it, but a good sample for those who do need it. tried to sign up for free sample. said I already had an account. tried to sign in: said no account existed ???? Horrible site to sign in. Gave up. I doubt it, My grandmother died at age 98 and still did not need this type of product. Used to good until they added fragrance. 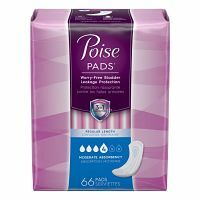 These could be used in place of sanitary pads. ditto. Doubt that I ever will. Am 77 now. Thank goodness I don't need these any more! OK, do not need quite yet!